This 14 January 2019 CBS TV video from the USA is called Los Angeles teachers go on strike after failed negotiations with district. More than 33,000 teachers in Los Angeles, California went on strike Monday morning, setting up picket lines at more than 1,200 public schools in the second largest school district in the US. Teachers are demanding higher wages, smaller class sizes and more support staff. The walkout is the largest struggle by educators since the wave of statewide strikes in West Virginia, Oklahoma, and Arizona from March to May in 2018. Unlike those previous strikes, where teachers were largely confronting Republican-controlled state governments, Los Angeles teachers are in a direct battle with the Democratic Party, which controls every lever of government in Los Angeles and California. The superintendent of the Los Angeles Unified School District (LAUSD), Austin Beutner, a former investment banker, is backed by powerful corporate interests, including the Eli Broad Foundation, pushing for the privatization of public education across the country. Beutner is demanding teachers accept a de facto freeze in real wages, increased health care costs and higher class sizes. In fact, the United Teachers Los Angeles (UTLA) has abandoned many of the teachers’ most critical demands—including an end to unlimited testing and the expansion of for-profit charter schools, which drain some $600 million annually from public schools. However, Los Angeles teachers, with the overwhelming support of students and parents, are determined to defend the right to quality public education. Both the school district and the state of California have budget surpluses. Beutner and Democratic Governor Gavin Newsom are deliberately withholding funds to the public schools to provoke a budget crisis in order to demand sweeping concessions and more privatization. While handing billions in tax cuts to Silicon Valley and the entertainment, finance and defense industries, California has still not restored school funding to pre-2008 levels. It is ranked 43rd in the nation in per-pupil spending. There is widespread support throughout California for a statewide strike. 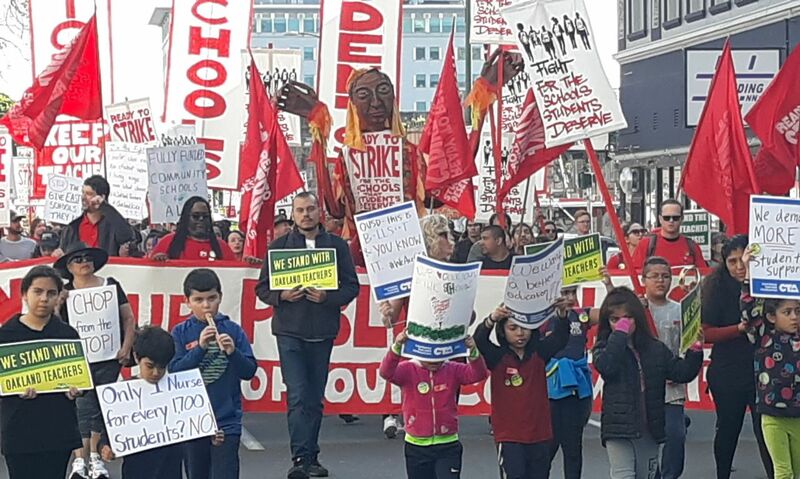 Thousands of teachers, parents and students protested in Oakland on Saturday against the threatened closure of one-third of the district’s 76 schools. Teachers in Virginia, Indiana, Denver, Colorado and other states are threatening strikes and protests. In an article, “Looming Los Angeles teacher strike could herald fresh wave of unrest”, Politico warned that the walkout posed the danger of “a new wave of ‘educator spring’ activity”, but this time in Democratic controlled states… “The fight is being watched closely in California and elsewhere to see if it is a harbinger of similar teacher labor action in the rest of the state or the nation”, the publication wrote. It is impossible for Los Angeles teachers to fight the powerful corporate and political forces arrayed against them on their own. Teachers must take the conduct of the struggle … by forming rank-and-file strike committees to reach out across the state, nationally and internationally. These rank-and-file committees should call on the more than 30,000 cafeteria aides, custodians and other support staff, being sent across the picket lines by the Service Employees International Union (SEIU), to support the struggle of teachers. They would organize mass picketing to close the 244 charter schools, which plan to operate during the strike. LA teachers must link up with Oakland teachers to make plans for joint strike action in preparation for a statewide strike. At the same time, teachers must reach out to every section of workers—locked out federal workers, Amazon, UPS and other logistics workers, oil refinery workers, dock workers, telecom, tech and manufacturing workers—to build up support for a general strike to fight austerity and social inequality. 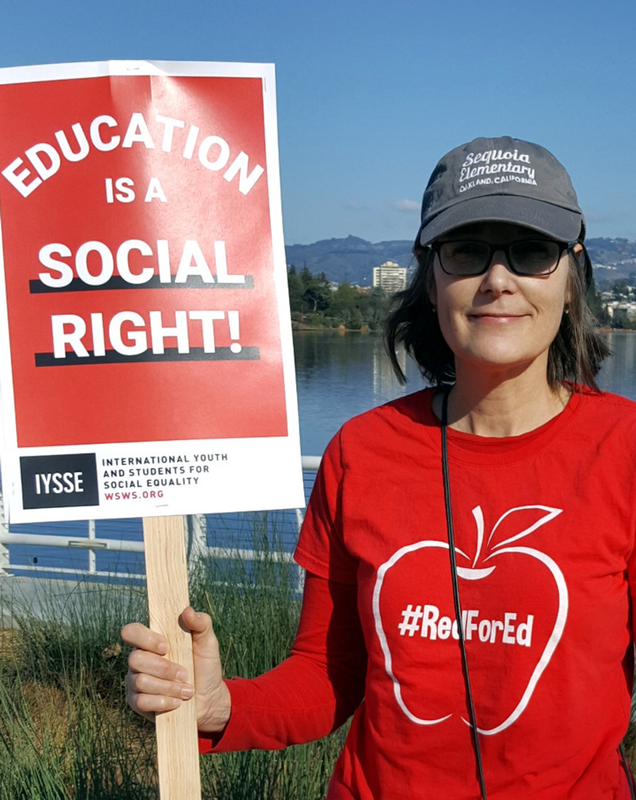 The battle of California teachers is a part of a growing wave of class conflict throughout the US and around the world. General Motors workers in Oshawa, Canada held a series of wildcat job actions last week and US workers are organizing to oppose plant closures. Thousands of French workers, including teachers, have been holding weekly “yellow vest” protests against the austerity policies of president Emmanuel Macron, and Dutch teachers and lecturers have voted to strike in March. Sri Lankan plantation and Bangladeshi garment workers held strikes earlier this month and tens of millions of Indian workers carried out a two-day general strike last week. The Los Angeles teachers strike heralds the escalation of class struggle throughout the world as 2019 begins. Thousands of French teachers join “Red Pens” protest on Facebook. “We have the same fight in France as the US”: here. This entry was posted in Economic, social, trade union, etc., Human rights and tagged Los Angeles by petrel41. Bookmark the permalink.